Building, testing, tweaking, and sending our wonderful flying machines into production and ultimately into our hands is all in the job description of the designer. They have to be dedicated mentally as well as be able to test ride and perfect the new generations of kites to guarantee progression of the sport. The future is in their hands. We caught up with Best kites head designer Peter Stiewe and found out what makes one of these mad scientist tick. The job is very much my focus, but that is just the way I am – I would do the same in another job. The beauty of doing what I do is that it allows me to be creative, follow my passion of watersports and meet great people on the way. But it needs to be said as well that travelling, be it on a test trip, or visiting the factories. It is not always easy and in no means a holiday. I’ve been doing this job within the kitesurf industry for 14 years and have had good and not-so-good times, but the passion for it never left. During this time I’ve spent a lot of time in the Dominican Republic, Brasil, Portugal, South Africa and Western Australia, which I liked a lot. Australia is probably one of the best places on earth for this sport. When we decided to make a dedicated wave kite, of course I was very happy to take on such a project since I like that part of the sport most. I also enjoy working on other products, be it the TS, GP or Extract. We have an incredible team as well – for example working with Ruben Lenten on the Extract or Youri Zoon and Gisela Pulido on the GP is fantastic. Analysing their needs regarding the equipment and then designing gear for world champions is a great pleasure. You’re a kitesurfer who has a big contribution to your design and the products you create. Who have been your inspirations? The biggest inspiration is finding a solution for a task. Are you designing for kitesurfers or the companies when you put pen paper? As a designer and kitesurfer I design kites for the sport. But of course as a company we have an organisational structure where requirements get analysed. In my department those requirements are put into product briefs that define the starting point of my work. In 2015 we have a very well diversified line up. 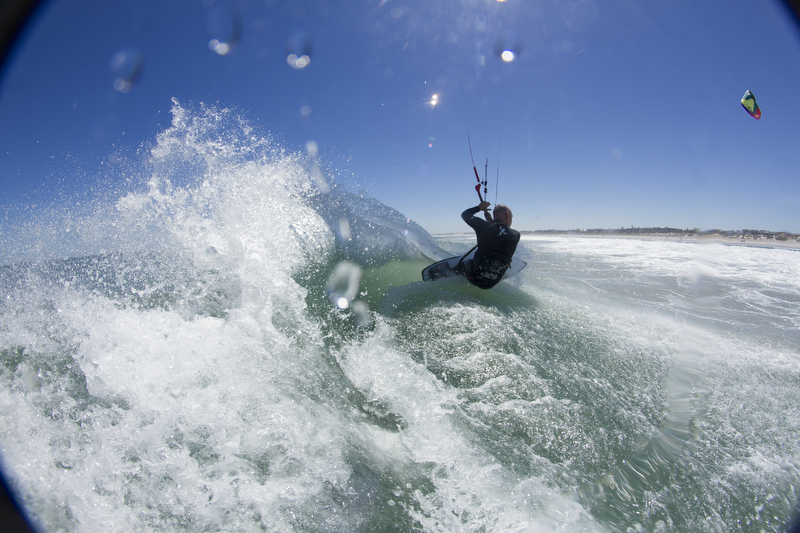 Kitesurfing evolves in different categories, each of these categories have different requirements towards the gear. The Cabo for example is an excellent wave kite, it can be used for freeriding easily, but excels in the wave and it will be hard to find its limits. Similar counts for the 2015 GP in its segment of Freestyle/Wakestyle. What is the company’s (POD) point of difference this year? Our crossover kites TS and Kahoona focus to serve a broad spectrum of performance. The development of gear will continue and we will see better and better gear coming to the market. As well the competitions will become more professional with higher prize, better coverage and more disciplines. This will allow the sport to grow and find more recognition. What style of kites do you focus your design on? I’m not opposed to any design style and use the different platforms depending on requirements. Currently I design open C kites, delta kites, c-kites (including 4 line and a 5th line c-kites). Do you have a secret recipe for a specific discipline? Waves, freestyle, race etc? Over the years I learned that most important thing for a good kite is that the kite is in harmony within its characteristics. Fine-tune and trim are very important. The ability to analyse and make the right design decisions for the respective product is key. Do you test your own designs? Yes, I fly and test every prototype. How do you factor in research and design? Development and design is scheduled, I work within a yearly timeline with each step precisely planned, so each of our departments knows when what happens. Research is separate projects that normally don’t have a deadline but are rather influenced by ideas and vision. Depending on results, these are implemented into the development schedule. Do the average customers give you feedback about the design or is it all high-end kite surfers? What’s the focus of research and design at Best Kiteboarding? We focus on both. The feedback of the end customer is important and is factored into the development process, especially in the product brief phase. But before the customer gets the product, a test team is involved with the tests and feedback process of the different prototype revisions. I grew up with watersports and had some history in it before kitesurfing. When kitesurfing became more popular in 2000/2001, I was in the Dominican Republic and coincidentally at the same beach as the Legaignox brothers. People like Franz Olry were present and ripping with an incredible style. I was addicted on the spot. That time the DR was like a vibrant birthplace of the sport. We kitesurfed, partied, brainstormed about gear and had a ball. It was a fun time. We gave some kites to the kids in the DR and some of them are now competing in the world tour. When visiting Germany, an old friend from the windsurf industry contacted me and quickly after I worked on kites for a windsurf brand. It was an exciting time, the technology was new and not a lot of people were involved in those days. I spent my time between the factories in Asia and the Dominican Republic. Then in 2003 the founder of Best tried some of my prototypes, really liked them and contracted me. Our mag is called Freedom Kitesurfing Magazine so I’d like to wrap up with the final question, why is kitesurfing Freedom for you? I would say I feel rejuvenated each time I come off the water. To be able to have that is a great feeling of freedom. From Issue 1 of Freedom. If you missed the print version you can subscribe here and make sure it never happens again. You can also contact us to get hold of back issues, these are going to be serious collectors items so you don’t want to go without.